What is a cataract? 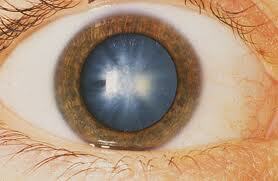 A cataract is a clouding of the normally clear crystalline lens of the eye. This prevents the lens from properly focusing light on the retina at the back of the eye, resulting in a loss of vision. A cataract is not a film that grows over the surface of the eye, as is often commonly thought. 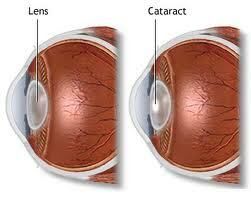 Cataract derives from the Latin cataracta meaning "waterfall". As rapidly running water turns white, the term may later have been used metaphorically to describe the similar appearance of mature ocular opacities. It is known that a chemical change within the eye causes the lens to become cloudy. Therefore the first risk factor is connected to the diet. Iodine deficiency may cause cataract as well. Excessive exposure to infrared radiation from furnaces, cigarette smoking are also cataract risk factors. Glassblowers were at the high risk to get cataract. Microwave radiation causes cataract formation. Cataracts usually develop in both eyes, often at different rates. Some drugs can induce cataract development, such as corticosteroids and Seroquel. Have regular eye exams. Eye exams can help detect cataracts and other eye problems at their earliest stages. Talk to your doctor about how often you should have an eye exam. Quit smoking. There is huge variety of the ways to quit smoking. Medications, counselling, hypnosis, patches and many other strategies are available to help you. Take care of your other health problems. Cataract does not usually come alone. It has very nice friends to accompany. Follow your natural treatment plan if you have diabetes or other medical conditions that can increase your risk of cataracts. Maintain a healthy weight. If you are overweight, start working on losing your weight naturally. The best ways that has ever existed is to change your diet and perform regular exercises. My husband decided that the easiest way for him to lose weight was turning to Raw Food lifestyle. He lost 30 LB in the first month easily. Choose a healthy diet that includes plenty of fruits and vegetables. Adding a variety of colourful fruits and vegetables to your diet ensures that you're getting a lot of vitamins and nutrients. Fruits and vegetables are full of antioxidants, which in theory could prevent damage to your eye's lens. Studies haven't proven that antioxidants in pill form can prevent cataracts. But fruits and vegetables have many proven health benefits and are a safe way to increase the amount of vitamins in your diet. Nutrition, nutrition, nutrition. When I was talking to a few elderly raw foodists I found out that they treated their cataracts without even trying to treat them. They all were treating much more serious illnesses like cancer or diabetes. Eye Exercises. Strengthen your eye muscles as well as the little eye capillaries in your eyes. Make sure that your eyes get plenty of fresh blood supply and the blood is able to sash out all of the toxins from your eyes. 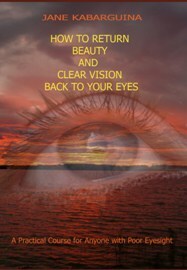 There are also some specific eye exercises that are designed for the lens. Eye Hydrotherapy or Eye Water Procedures. They are extremely helpful with the cataract. Just one water procedure that I recommended to my Grandma stopped development of her cataract and she was able to do her knitting again. Now she also enjoys reading.